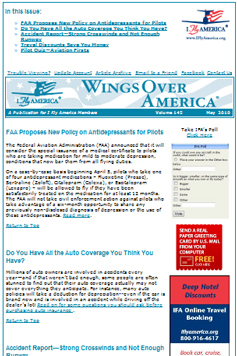 The IFA Wings Over America® is a newsletter with a difference. When you join IFA, you’ll receive The IFA Wings Over America® newsletter, available exclusively to members. You will receive each issue via email. Lively and original, The IFA Wings Over America is written by professional authors and journalists who are also pilots. 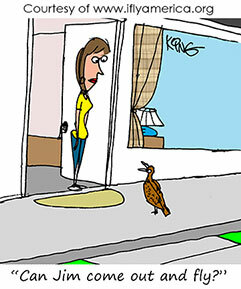 Articles are based on real-life, personal, hands-on experience. It’s about the things pilots and aviation enthusiasts like to read about. But more than that, we know what aviators need to know because we’re in constant touch with change as it happens – in flying safety and health, current regulations and issues, fascinating destinations. All of our articles are based on the expertise and experiences of people we know and trust, who understand the responsibilities and endless opportunities of aviation. Each issue of The IFA Wings Over America is a reliable resource for aviation tips, and the latest money-saving, pleasure-stretching benefits of your IFA membership. Click here to view an issue. Or, click here to view our article index. Join today for only $15 a year and get six issues of The IFA Wings Over America a year, plus all of the IFA Member Benefits designed for aviators and aviation enthusiasts like you. And every time you use them, you’ll not only benefit personally, you’ll help support IFA’s mission to promote flying safety, affordability, growth, and fun.